In the practical examination along with experiments you have to face viva voce from the internal / external examiner. It is just to know your depth of knowledge and understanding of the given experiment / project work. Based on your performance you will be credited with the deserving score. As CBSE releases the date sheet, students get engrossed mostly in preparing for the theoretical examinations. As a result, most of the students skip preparing for their practical examination which is also important part for grabbing overall a good score. In each of these subjects Physics, Chemistry and Biology 30 per cent marks is reserved for their Practical Examinations. That means out of 100 total marks, 30 marks is allotted for Practical Examination. And out the 30 marks of Practical, generally 5-7 marks is kept for viva voce. 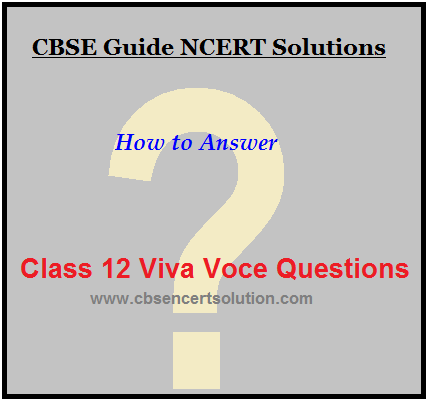 The questions asked as well as the circumstance in which a student faces viva voce are different from the theoretical examination so it is always better to prepare for viva voce separately. A student with some prior preparation for viva is definitely going to give him or her more confidence. Besides knowledge, confidence level and body language also play an important role while facing the external taking viva examination. Methodology and Principles are frequently asked questions in viva voce hence; you should know the basics of the experiment. There might be the some of the questions based on the experiment you are asked to perform like how the slope is calculated, what is the aim of experiment, what are apparatus required, what are the precautions that need to be taken into account, etc. You should be able to explain how you performed the experiment. How you took the readings. Another important question is about the least count of the measuring instrument. The level and variety of questions asked in viva voce depends solely on the concerned teacher and the type of experiment given to you and so, there can be plethoras of questions in subjects.